Nobody Puts Big Mama In A Corner. I swear I was only kidding. But, you don’t challenge Big Mama. Or, she just might do what you asked. And, she brought him back alright. 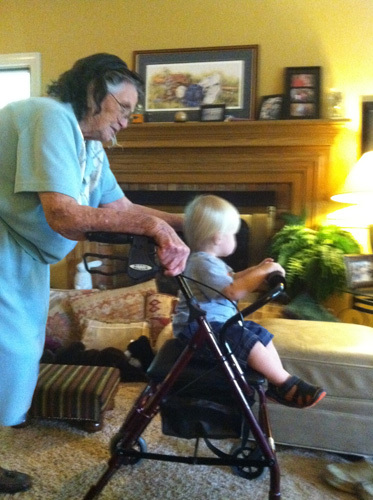 He just wasn’t so happy when she took over her walker again, and he lost his awesome ride. There is not another Big Mama. And, Jett Takle and I couldn’t be happier that she is in our lives. I’m not always a solution finder. Oddly, I can offer solutions for your drama and obstacles. Just not mine. Not always. I get stressed. And, I whine. She consistently inspires me with her ability to find solutions. Stress-free. With a “we can make this work” attitude. A few weeks ago, I asked her if she could watch my littlest man for an hour, so I could attend a meeting. When she arrived to chase him with her walker, he was sleeping. “Well, alright. Get that stroller, and put it outside his door. I can pick him up out of that crib. I’ll put him in his stroller, and push him right into the living room,” she said with confidence. “Hmph. Of course, I’m sure! Now, go on!” She assured me. And, that’s exactly what she did. All the while pushing her walker, too. Since when did the rest of us start making everything so hard? Since when did we start letting the little things overwhelm us? How did we stop appreciating modern day conveniences that make life so easy….like a dang dishwasher? My 91 year old grandmother has hand-washed her dishes since the day she started maintaining a home. She’s never complained. Or stressed. Or thought life too hard. Perhaps, it’s because she comes from a generation where you make situations work for you. You overcome obstacles. And, you certainly don’t whine about them. Perhaps, it’s because if she wanted candy as a young girl, she traded eggs for it instead of being given money to buy it. Perhaps, it’s because she recognizes the small stuff as small stuff and doesn’t sweat it. And, she really believes she can. May I grow up and be just like Big Mama. 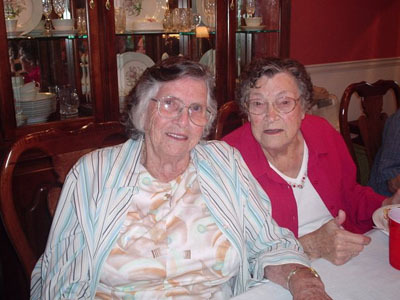 Actually, a near century has ended when you consider the sisterhood of Big Mama and Aunt Kate. 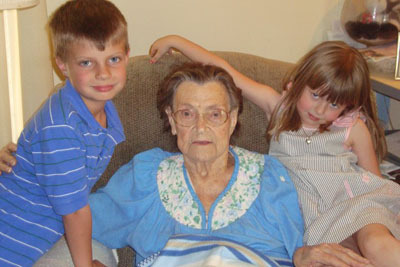 Aunt Kate passed away on Thursday. The kids and I were blessed to spend time Mother’s Day weekend with her. And, I’m beginning to think that Aunt Kate’s sassiness was inherited by my five year old. I’m not sure, but I think had Anna been a teenager post the crash of ’29, she would have cut her hair short, smoked a cigarette, and looked down a well in the month of May in hopes of seeing her true love’s reflection. Just like Aunt Kate did. Hence, my great task of parenting her intentionally. Of course, I did dip snuff with Aunt Kate when I was a young one. Well, I’d put a tissue down my blouse like she did and she’d give me a red Dixie cup to spit in. Okay, to spit my cocoa in. Nonetheless, her personality was contagious enough to want to mimic. 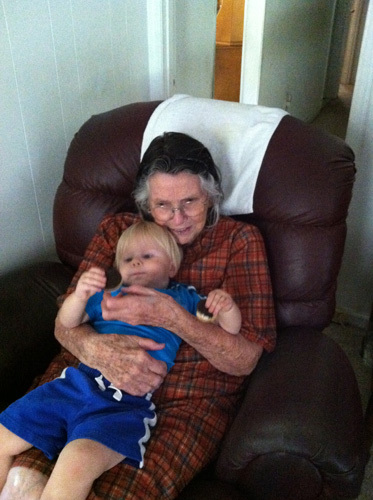 And while I’ll miss her always telling me, “Love ya, babe,” no one will miss her like Big Mama. Orphaned at very young ages and raised by their eldest siblings, they endured a Depression together, times of war together, good times, and trying times. Big Mama married one Edward Goss. Aunt Kate married his brother, Van. They never closed their eyes to sleep without one calling the other to say, “Goodnight, sweet dreams, I love you.” Ever. 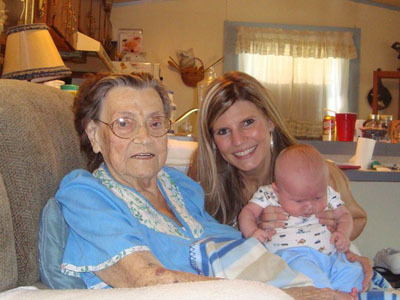 On the day Aunt Kate died, she called, “Callie Mae!” Big Mama made her way to her side. Aunt Kate didn’t say a word, but Big Mama just knew what she wanted to say. A sisterhood that lasted 91 years. I really can’t imagine. You’ll be missed, Aunt Kate. I love ya, babe.